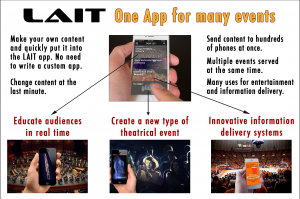 As a part of the University of California artists’ residency program, LAIT is being demonstrated through a participatory mobile device improvisation using the LAIT app. This week-long residency features performances, improvisation, workshop, lectures designed to support the development of LAIT as conceptual frameworks are being identified. 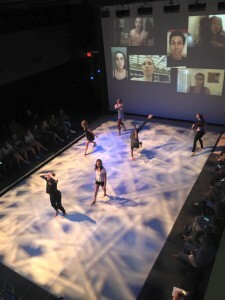 John Toenjes, Associate Professor and Music Director at the University of Illinois Urbana-Champaign Department of Dance, will be a guest artist in dance as part of the Department of Dance’s Monthly Guest Performance Artist Series from October 17-25, 2015. While here, Toenjes will collaborate with Assistant Professor Chad Michael Hall to create phase one of their collaborative project INTERFACE: Public Figure. 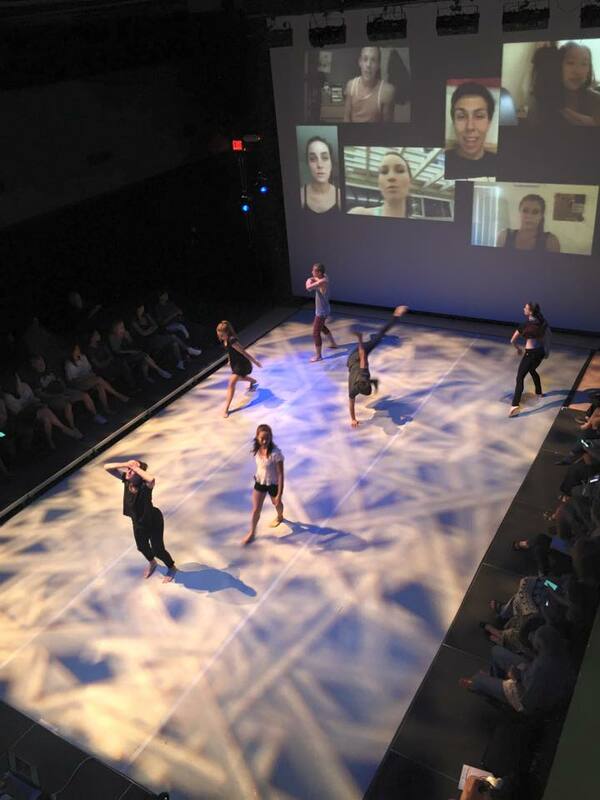 There will be two showings of the work- Friday, October 23 at 7:30 pm and Saturday October 24th at 2:00 pm. Showtimes and locations available on the Claire Trevor School of the Arts. 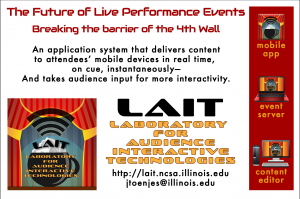 John Toenjes demonstrated the LAIT (Laboratory for Audience Interactive Technologies) system, and lead workshop participants through a participatory mobile device improvisation using the LAIT app. Afterwards, based upon feedback from participants, we may remake the app and redo the improvisation, to explore possibilities within this innovative art form. Participants are urged to bring Apple or Android smartphones and/or tablets, and to have their batteries fully charged just prior to the workshop. Additionally, Toenjes will guest teach in INTERFACE Ensemble (Hall’s student ensemble), Dance and Video, and will present his LAIT workshop which is free and open to the UCI community in the xMPL Theater on Friday, October 23rd at noon. The LAIT project has been selected as one of ten proposals to be developed on behalf of the Illinois Learning Sciences Design Initiative (ILSDI). Facilitated by the College of Education, this initiative features the work of emerging technologies being developed on-campus by competing teams of interdisciplinary researchers. This fall, LAIT collaborators are working on two fronts to make the project more robust. The technical team is increasing the modes of communication between audience and facilitator. The aesthetics team is writing a conceptual reflection of LAIT’s potential, outlining future applications and thematic considerations. In November, the aesethetics and technical team will put forth a proposal for deploying LAIT in educational settings, both in the classroom and beyond. The goal of ILSDI is to foster collaboration among different departments and make use of Illinois’ outstanding faculty and research facilities. At the kickoff luncheon on September 18, John Toenjes outlined the current status of LAIT’s technical capabilities. 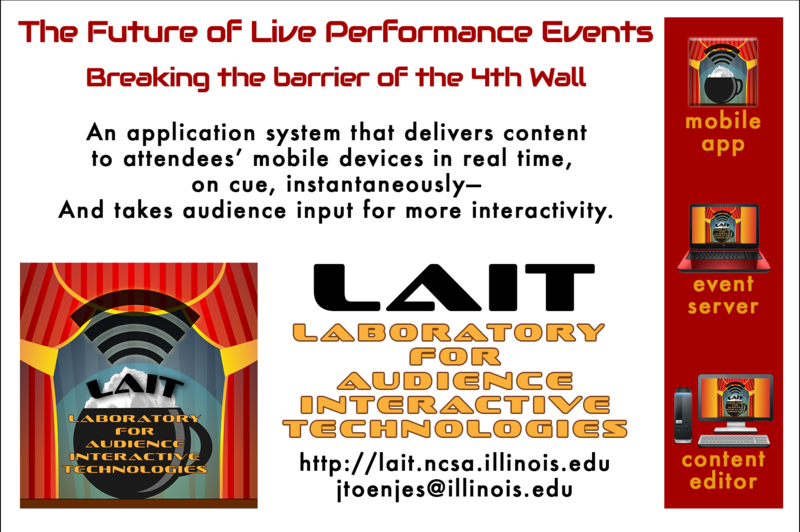 LAIT will be presenting a poster session at the 2015 Share the Vision event at the iHotel this Thursday, Oct. 8. Look for us at the lunchtime poster sessions!